Prof. Maurice Kamto, the man widely believed to have won last month’s presidential election in Cameroon has been released after briefly arrested for addressing a crowd in front of his house when Mr. Biya was being sworn in at the National Assembly. Prof. Kamto was taken back to his residence in Santa Barbara by armed police officers where he is expected to be under house arrest, but the legal mind has refused to be quarantined in his house and is asking the police to provide a document that subjects him to a house arrest. It should be recalled that after his swearing-in on Tuesday, November 6, 2018, Cameroon’s President, Paul Biya, ordered the arrest of prominent members of the MRC, the party led by Professor Kamto who actually won last month’s presidential election. Among those arrested with Prof. Maurice Kamto are Barrister Emmanuel Simh, Prof. Alain Tedom Fogue, Mr. Okala Ebode and Mr. Christian Penda Ekoka who has served as Mr. Biya’s economic adviser before resigning to join the opposition. Some 20 other member of Prof. Kamto’s closest collaborators were also arrested while attending an impromptu meeting with some of their party members. Addressing his party members at the meeting, Prof. Maurice Kamto, a legal expert, stated clearly that he had been elected by Cameroonians based on merit and not based on his ethnic background, adding that he had been elected to represent all Cameroonians. He stressed that he had been elected based on his political program that focused on the poor, the humble and the suffering masses who have been working hard to enable the country stay afloat. He added that today was a very bad day for democracy in Cameroon. 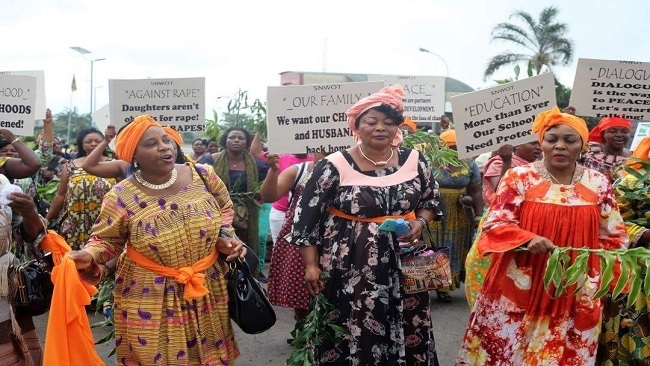 He deplored that fact that many Southern Cameroonians were living in the bushes in the North West and South West regions of the country, with thousands seeking a safe sanctuary in Nigeria. He said the people could count on him as he and the winning coalition that enabled him to win the election would continue to fight on the people’s behalf. He stressed that Cameroon belonged to all Cameroonians and that no Cameroonian should be judged based on their tribe. He pointed out that Biya had been sworn-in as the country’s president because of the system is corrupt, adding that for the past 36 years, Mr. Biya and his collaborators had fostered tribalism. Shortly after addressing the crowd, Prof. Kamto and his collaborators were whisked away to the Elig- Essono Judicial Police where they are being questioned. Mr. Biya’s iron feast has started striking his opponents even as he promised during the swearing-in ceremony that he would work hard to reunite the country; something he has failed to do in 36 years. He promised to restore peace in the North West and South West regions, but did not provide details on how he was going to achieve that given that for more than 24 months, the English speaking regions of the country have been under the control of separatists who have made them ungovernable despite the government’s violent military adventure. He urged the youths in the two regions who have given government troops a run for their money to return to the path of peace by dropping down their weapons. “I want to call on the youths engaged in hostilities to drop their arms and follow the right path…especially the younger ones who have indulged in a fruitless cause,” he said. He pointed out that negative forces had taken advantage of the genuine demands of the people to foster a secessionist agenda which he stressed was against the country’s constitution and the notion of living together. 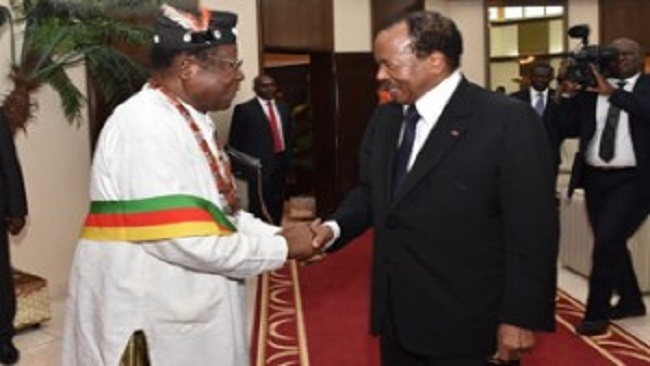 Shortly after the swearing-in ceremony, the Cameroon Concord News Group reporter in Yaounde spoke with a senior member of the ruling CPDM from the North West region who has been pushing for dialogue and reconciliation. From the discussion, it was clear that there were lots of frustrations within the ruling party as the conflict in the English-speaking regions continues to escalate. The CPDM member who elected anonymity said that Mr. Biya might have been sworn in as the country’s president, but he knows that he did not win the election and should use this opportunity to undertake actions that will enable the country heal. “He knows he did not win the election. He knows that a lot of fraudulent things have been done to keep him in power. I think he should now start thinking of bringing the country together by calling for inclusive dialogue that will enable the country heal,” he said. “He should be thinking of the type of Cameroon he would be leaving behind. He has been robbing other people of their victory for more than two decades. In 1992, he robbed Mr. Fru Ndi of his victory and today, he has been sworn in as the president of the country, robbing Professor Maurice Kamto who is very much admired by the people and the international community. He cannot continue to usurp power. He has pushed the country to the brink. He has transformed himself into a monarch and this makes it hard for those around him to tell him the truth,” the CPDM senior member regretted. “I know Cameroonians are always expecting Mr. Biya to die as they believe his death could herald the beginning of a new era and the end of hostilities in the two English-speaking regions, but I strongly believe that he has been sentenced to life by God. He will not be dying anytime soon and he might live long to see the country change. People like him spend more time regretting in the later part of their lives. I hope he will use this term in office to reverse some of the damage his inefficient management has brought to the country,” he stressed. “Mr. Biya has had a long time to bring peace and security to the country, but he seems to be happy seeing others bleed to death. I am a member of the ruling party and I can tell you that many in the party want the issues that have weakened our country to be addressed very fast. But the hawks in the regime like Prof. Fame Ndongo are insisting that only an all-out war can resolve the Anglophone crisis. We have already lost more than 1,500 soldiers and some 3,000 civilians in the English-speaking regions of the country. How many more Cameroonians have to die before Mr. Biya realizes that he has failed the people?” he quipped. Though Mr. Biya has been sown in today, it is clear that not much will change. The next seven years will not witness any fundamental political changes and this will make many people to continue to think that the country is a ticking time bomb. Cameroon is replete with many problems and many of them are off-shoots of the mismanagement, tribalism and corruption that have become the country’s hallmark. Corruption has robbed the country of the financial resources it needs to undertake major development work.